Jia Chang tofu is fried tofu braised in a spicy sauce with a little meat and maybe a simple vegetable like bamboo shoot, a common Sichuan dish. I have noticed most people described this dish as 'homestyle tofu' which is not really correct. The two words Jia Chang (家常) though is the same writing as 'homestyle' in Chinese but when talking about Sichuan Jia Chang it means this is a type of cooking or flavouring like fish fragrant (魚香 yu xiang ) or numbing spicy (麻辣 ma la). The only thing homestyle about this dish is all the ingredients are common in most Sichuanese kitchen. 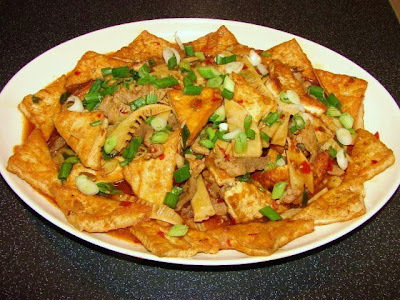 There are many 'homestyle tofu' recipes but not Sichuan Jia chang tofu. Ingredients are approx. More or less does not really matter. Cut tofu into 8 - 10mm thick slices in triangular shape or rectangular shape. Lay these on kitchen paper to absorb any excess water for a while. Then fry with oil till golden both sides. Normally these are deep fried but I fried them with 5 - 6 tbsp of oil in several batches. In a clean work heat about 1 - 2 tbsp of cooking oil, add ginger and garlic fry for about a minute then add pork and fry till browned, add chilli bean sauce follow by bamboo shoot and stir fry for a while then add dash of cooking wine and chilli. Add in the fried tofu and stock/water and bring this to the boil. Let the tofu braised for about 10 - 12 minutes till the tofu pieces have abosorbed about 3/4 of the liquid. Taste if salty enough if not add dash of soy and sugar to taste. Add dash of sesame oil and slackened cornflour to thicken. Then stir in 3/4 of the spring onion, plate up and sprinkle on the remaining spring onion. i really love your blog- i went out today, looking for the sichuan chilli paste (inspired by you). found a chilli bean paste as well as a chilli black bean paste, what should one ask for in english? i also had some Lai You at a restaurant, is that the same thing? i cant remem if i have asked you this before, but are you on twitter? many thanks for your recipes. theyre inspiring. Take a look at this post http://sunflower-recipes.blogspot.com/2008/11/chinese-ingredients.html I had listed a range of Chinese ingredients incl. sauces with their Chinese name. Sorry exromana I misread your question, you asked for sichuan chilli paste not chilli bean paste. Sichuan dishes use a lot of chilli bean sauce though, using this sauce is fine too in many dishes. and was wondering what you think of it? is it the same type of product you use? i dont live in the UK, so i dont have access to the products you suggested (thanks for the reccies, though). i dont know if this product i bought is preservative-free (the one you suggested was, and i'd love to find one like that).thanks for your advice. regarding lai you, this is how the lady wrote it for me on a piece of paper (phonetically), she said it is a chili oil, which they make themselves in the restaurant kitchen; (the 'i' in 'lai' had an accent on it, dont remember whether it was slanting to the left or right, so the word could be pronounced lak, as you said). really love your blog, thanks for the help. The picture of the link you have shown is chilli oil, original or extra hot, it's Guilin style I reckon from Hong Kong from the brand shown. I think I have seen them in London today, not sure any good not tried it yet. Chilli bean sauce/paste is not the same as chilli oil. Chilli bean sauce/paste is made with fermented beans (soy or broad beans) and ground chilli. It's quite salty. Some Chilli bean paste/sauce like the one I'd mentioned before has added chilli oil. Chilli bean sauce/paste is a must have Sichuan cooking sauce. thanks for all this wonderful information. yr blog is gorgeous.